Personal finance is a sector awash with good-quality resources. Let’s take a look at the best way to keep up with everything. The one tricky thing can be keeping up with them all. You can follow most sites on social media but that is quite a sloppy way to keep up. It’s easy to miss updates and you have to deal with all the other fluff on social media too. For those reasons it’s not the best way to see new posts. One option is to bookmark the homepages of all the personal finance blogs you like to follow. However, it isn’t the most efficient way to go about it. If you have to open your bookmarks folder each time and click on each website it becomes a bit of a laborious process. It can also be frustrating to let the webpages open up only to find there isn’t anything new to read on that particular website. But using bookmarks is still an option if you want to use it. It can be good if you only follow a few websites. A much better method than bookmarking, is to use the free RSS feeds that almost all websites have. In order to keep up with the RSS feeds you will need an RSS reader. I use a free service called Feedly. I’d recommend you consider it because it’s always been reliable for me. But there are plenty of other services too. You can get the Feedly app on your smartphone and also use it in your desktop. Search for it in your app store on your device to install it. Once installed you can then login to your account to see all the latest posts you want to see. If you want to look at all the readers available on smartphones and tablets simply type in ‘RSS reader’ into your Google Play Store or iOS app store. There are plenty of others that receive glowing reviews from users so check them out, I’ve not tried them so I can’t give feedback on how good they are. Once in your RSS reader you can then add the sources you want to keep up with. Each time you want to read the latest on what is going on at the best personal finance blogs you can fire up the app, or visit the website on a desktop, and see what there is. 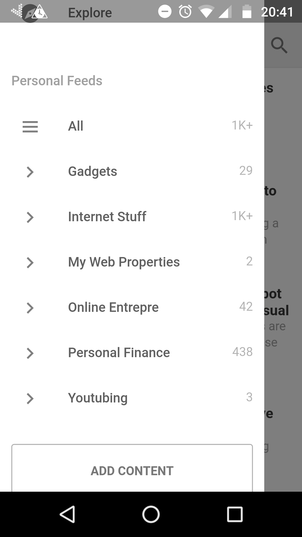 If you read lots off different sites then you can also manually create categories to help you separate them. Here is how mine looks. As you can see I keep up with lots of sources! Obviously the first website you should subscribe to is MoneyCortex.com, because it’s the best of all the money-making websites 😉 You can simply type our website address into your RSS reader and it should find the feed. If it has any issues then use the direct RSS link: https://moneycortex.com/feed. You can also find lots more at InvestmentZen who have a huge toplist of potential sites to follow. Hopefully this makes keeping on top of the latest financial blog posts a little bit easier for you. It’s good to make sure you see as much content as possible. You never know when you may stumble across the one piece of writing that changes your fortunes!